For those special moments when they just melt your heart, reward them with a CESAR® SOFTIES™ treat. 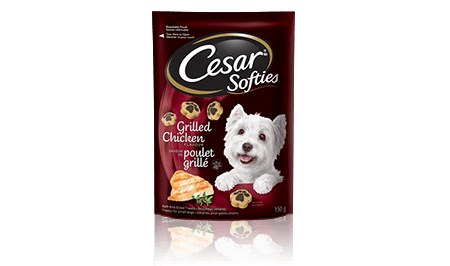 With an irresistibly soft texture and mouth-watering Grilled Chicken flavour, your small dog is sure to love them. RICE FLOUR, WHEAT FLOUR, SUGAR, GLYCERIN, PROPYLENE GLYCOL, ANIMAL FAT (PRESERVED WITH BHA), CARAMEL COLOUR, NATURAL POULTRY FLAVOUR, POTASSIUM CHLORIDE, SALT, NATURAL GRILLED CHICKEN FLAVOUR, CALCIUM PROPIONATE, POTASSIUM SORBATE, HICKORY FLAVOUR, WATER, SODIUM TRIPOLYPHOSPHATE, TITANIUM DIOXIDE, COLOUR.